Hey Music, What Have You Done For Me Lately? 1. Mom and Dad are making them do it. 2. They have an interest in playing an instrument but have no plans to pursue music, because…HELLO… they plan to actually make money. 4. They love music and want to live a life in music. It is exact, specific; and it demands exact acoustics. A conductor’s full score is a chart, a graph which indicates frequencies, intensities, volume changes, melody, and harmony all at once and with the most exact control of time. It is rhythmically based on the subdivisions of time into fractions which must be done instantaneously, not worked out on paper. Most of the terms are in Italian, German, or French; and the notation is certainly not English but a highly developed kind of shorthand that uses symbols to represent ideas. The semantics of music is the most complete and universal language. It requires fantastic coordination of fingers, hands, arms, lip, cheek, and facial muscles, in addition to extraordinary control of the abdominal, back, stomach, and chest muscles which respond instantly to the sound the ear hears and the mind interprets. It allows a human being to take all these dry, technically boring to some (but difficult) techniques and use them to create emotion. That is one thing science cannot duplicate: humanism, feeling, emotion – call it what you will. 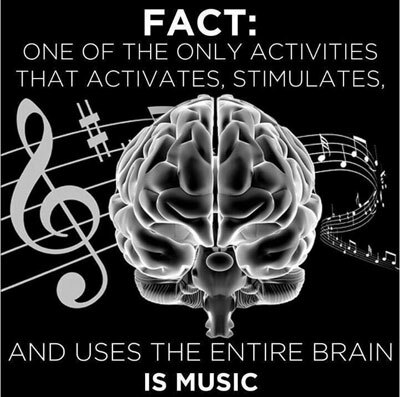 THAT IS WHY WE STUDY MUSIC! Not because we expect you to major in music. Not so you can relax. Not so you can have fun. But so you will be human; so you will recognize beauty; so you will be sensitive; so you will be closer to an infinite beyond this world; so you will have something to cling to; so you will have more love, more compassion, more gentleness, more good – in short, more life. Of what value will it be to make a prosperous living, unless you know how to live? Thanks Nancy! Music is such an important part of life – it helps us to celebrate joyous events as well as soothe us during times of sorrow. It heals and it makes us want to dance! My son put it well when he said, “The world would be a sad, sad place without music” How true.